Bhubaneswar: Central Women’s Committee(CWC), Nayagarh and Maninag Jungle Surakhya Parishad(MMJSP), Ranpur jointly organized a consultation on the “Plantation and its impact on the life and livelihood of women” with the support of Vasundhara and Centre for World Solidarity(CWS) at DRTC–CYSD, Bhubaneswar. There has been gross violation of Forest Rights Act, 2006 and PESA, 1996 while taking up plantation programmes over the community forest Area; The concern gram sabhas are hardly been taken into confidence and the Forest Department people doing plantation with Vanan Suraskhya Samiti; Forcible plantations are being done over forest land occupied by the tribal and forest dwelling community evicting them from their genuine rights. Even plantation reported to have been done over forest land recognized under Individual Forest Rights Act, 2006 in Kandhamaland and Nabarangpur district; Plantation causing huge loss of natural forest and loss of ntfp; In the name of forest protection, the Forest Department in fact restricting the community to access by putting iron fencing around forest; The forest department intentionally not cooperating in the recognition of community rights in the State; Planation has created conflict amongst the community people between VSS and Forest Rights Committee(FRC); Since the forest department adopted the timber based forest and destroyed the natural vegetation badly affecting the fodder of the wild animals leading to entering of wild animal i.e. Elephant into the human habitations; The huge money floating from the Centre in the name of plantation under different schemes and programme like CAMPA fund, Ama Jungle Yojna, Avenue Plantation etc., has leg huge corruption at the forest official level which is quite evident from the news of vigilance red in the house of a number of forest officials in the State; and there has been lack of proper monitoring mechanism of the plantation done over the period. 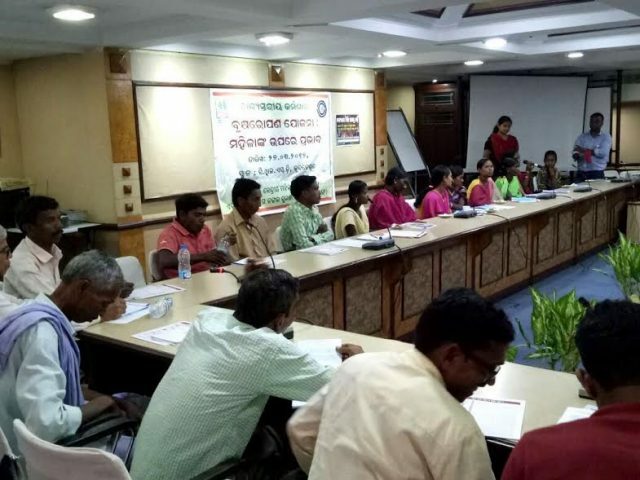 Joining as a guest speaker Biswajit Mohanty of Odisha Wildlife Society called upon the community people to use RTI and seek information on the planned plantation programme in the State so that it can be effectively dealt before head at the community level in the ground. Sharing the plantation pressure due to huge amount of CAMPA fund in the State, he shared that while the current annual budget of State Forest Department is 50 to 60 crore, it will enhanced upto 500 crore once the 40,000 crore CAMPA fund will be released. Since there is no open place to do plantation, more and more conflicts will be there between the community and Forest Department in the coming days” he further said. He also proposed to form a Plantation Tracking Cell at the State level. Manohar Chauhan, Member, CSD, Odisha, joining the consultation called upon the community people to use FRA, 2006 as weapon so as to establish Gram Sabha Sarkar in the village and to hold Gram Sabha and to dissolve VSS formed in the past by the Forest Department and to form Forest Protection and Management Committee as per Section 4(1) (e) of the Forest Rights Rules, 2007. He also asked the community people to demand direct flow of plantation and forestry fund to the gram sabha. Arakhita Sahu, Secretary Maninaga Jungle Suraskhya Parishad, Ranpur, shared on the initiatives taken by the community people in claiming CFR rights in the Nayagrah district. While Y. Giri Rao, Director, Vasundhara and Chandana Das CWS presided over the different session of the programme, Puspanajali Sathpathy, Bhagyalaxmi Biswal, Manas Mishra, Ranjita Patnaik from Vasundhara coordinated the programme. Pratima Jena, President of the CWC gave vote of thanks to all the participants at the end of the programme.